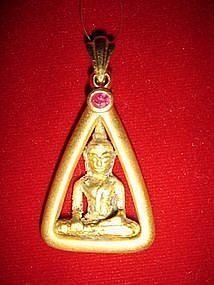 Very attractive bronze Buddha Amulet-Pendant with genuine Burmese Ruby and 24 K. Handmade Gold casing in brushed finish. Origin: Thailand. Setting is new.